The most effective anti-bullying skill is almost never taught. Acting out of anger makes things worse. 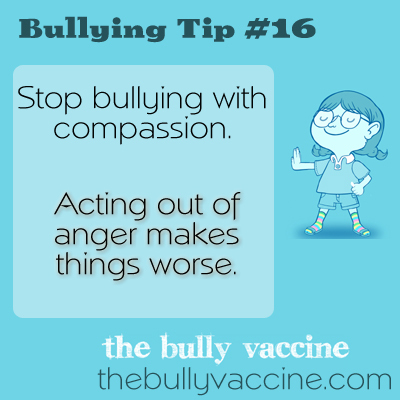 The most effective tool for combatting bullying is compassion. Unfortunately, we rarely teach that skill. Compassion is defined as: sympathetic pity and concern for the sufferings or misfortunes of others. In the context of bullying, it means not viewing the bullying as an ogre, but instead – viewing them with pity – someone who needs help. This is an incredibly powerful way to approach bullies because a) it makes sure you are not part of the problem and b) ensures you focus on helping – not retaliating.